Before we explain how you can build a workflow to perform dynamic record re-assignment based on conditions, let’s briefly describe the importance of dynamic record re-assignment. As your business grows, so does the need to become more efficient. The more records you have to process on a daily basis, the more difficult it becomes to focus on your long-term goals. It goes without saying that you need to delegate, you need to assign records to the right person or team. How can you achieve that? That’s where Flexie CRM comes into play. Assigning records such as leads, contacts or accounts to the right people within your organization is crucial. When everyone inside of your company is assigned the right record based on the his/her expertise, efficiency will most certainly improve on the short, medium and long term. To explain how you can create a workflow with dynamic record re-assignment based on certain conditions, we’re going to consider a concrete example. Let’s suppose your team has cold called several prospect and now you need to process them, to nurture them. Since you know very little about them, their default status is ‘New’. 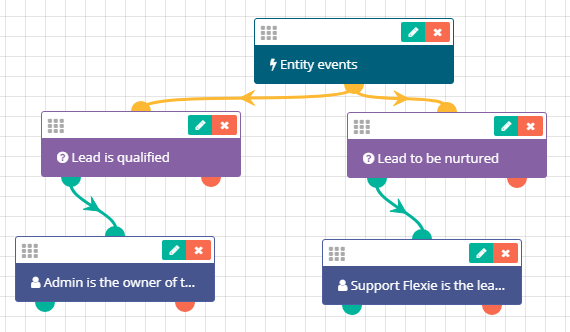 We’re going to build a simple workflow where the change the owner of a lead(s) based on specific conditions. 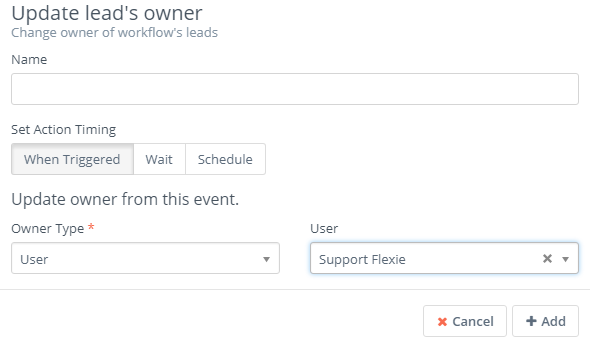 To do that, head over to Workflows and then click Manage Workflows. Go the the upper-right corner of the panel and click New. Next, choose Lead as the workflow entity type and then click Select. Give it a name, write a short description(optional) and then click Launch Workflow Builder. 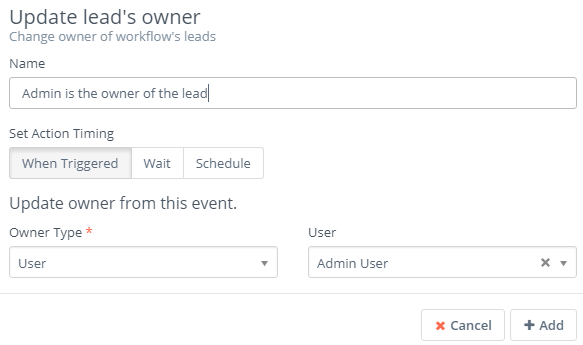 Since you want to change the lead’s owner upon a lead’s update, choose Entity events as the source of your workflow. On Entity events select on Entity Update and On fields change select Status. Next, click Add. Now, let’s suppose your team needs to qualify the lead. What we want to do next is change the lead’s owner once its status is set to Qualify. To do that, go to Conditions and set the rule as Status equals Qualify. Next, click Add. What we want to do next is change the lead’s owner, assign the lead to a user or group within the CRM. To do that, go to Actions and select Update lead’s owner. First, you have to choose the owner type, if it’s a user or a group and then select the user or group whom do you want to assign the lead to. Next, click Add. Let’s further suppose that your agents have cold called the lead. He/she has shown some interest in your product, has filled in your form and now your sales team has to nurture the lead until it becomes a client. What if you wanted to change the lead’s owner if the lead’s status is ‘nurture’? In Flexie CRM, you can easily do this by adding another condition. This time, however, you must set the rule as Status equals Nurture. Now, if the lead status is Nurture, you might want to change its owner. To do this, go to Actions and then click Update lead’s owner. Once you choose whom do you want to assign the lead to, i.e who’s going to be the lead’s owner, click Add. As you can see, dynamic record re-assignment based on certain conditions is very useful, especially when you have a huge number of records that need to be processed. By re-assigning the right records(leads, contacts, accounts,etc) to the right user or group, you improve efficiency and overall productivity. The workflow we’ve built is just one of the many examples of record re-assignment based on specific conditions.